← BAR 107 IN DTLA IS CLOSING DOWN! 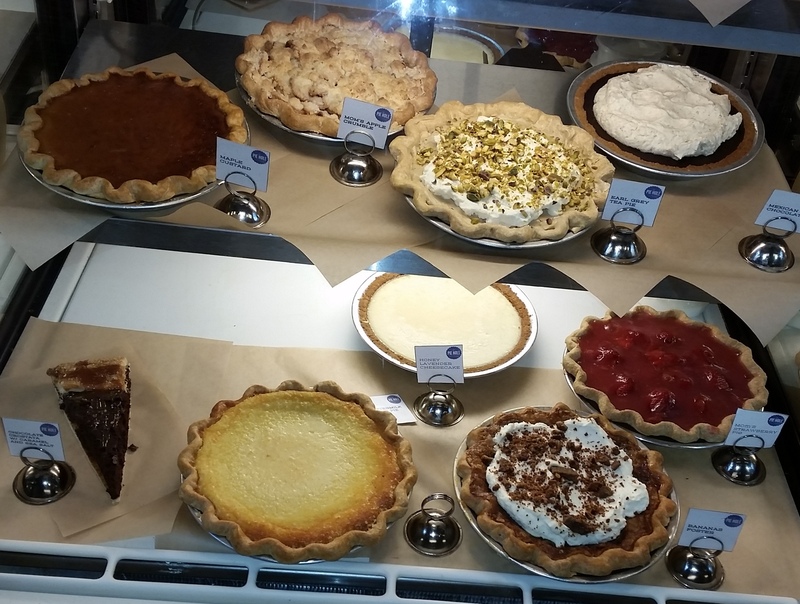 when you finally make it to the display case and actually see all the pies, you start all over again. By the time it was our turn to order, I decided on a slice of the Bananas Foster. My husband was leaning toward a slice of the Apple Pie, but I called him “boring and predictable” and he reluctantly ordered the Chocolate Crostana with Caramel and Sea Salt. (I don’t know what a crostana is, but it looks amazing. It was my second choice, so I was glad my shaming worked.) Once you place your order, you are given a number and your pie slices are delivered to your table. Now if it’s a busy day at The Pie Hole finding a seat can be difficult because most of the time all the seats are taken. This is where being friendly to the people in line comes in handy. The nice couple that was in line in front of us got a 4-top outside, so we shared the table with them. When our pie slices were delivered there was one little problem… no forks. Apparently you need to grab your own utensils and napkins. I ran back inside (yes, I literally ran… there was a piece of Bananas Foster (below, left) pie waiting for me, I was in a hurry) and quickly returned with forks. I crammed that first piece into my “pie hole.” Wow! It was so good… so good. I didn’t look at my husband for the next few bites because I didn’t want to share, but then I remembered he had that Chocolate Crostana (above, right). I make eye contact with him and he’s already looking at me. I can tell he’s not loving it. We switch plates and I dig into this Crostana. It was really dense and chocolatey (is that even a word?). Too rich for me and I have to wrestle my Bananas Foster back from him. He gave me a look and I calmly said, “You should have ordered the Apple Pie” as I crammed the last piece of the banana goodness into me face. 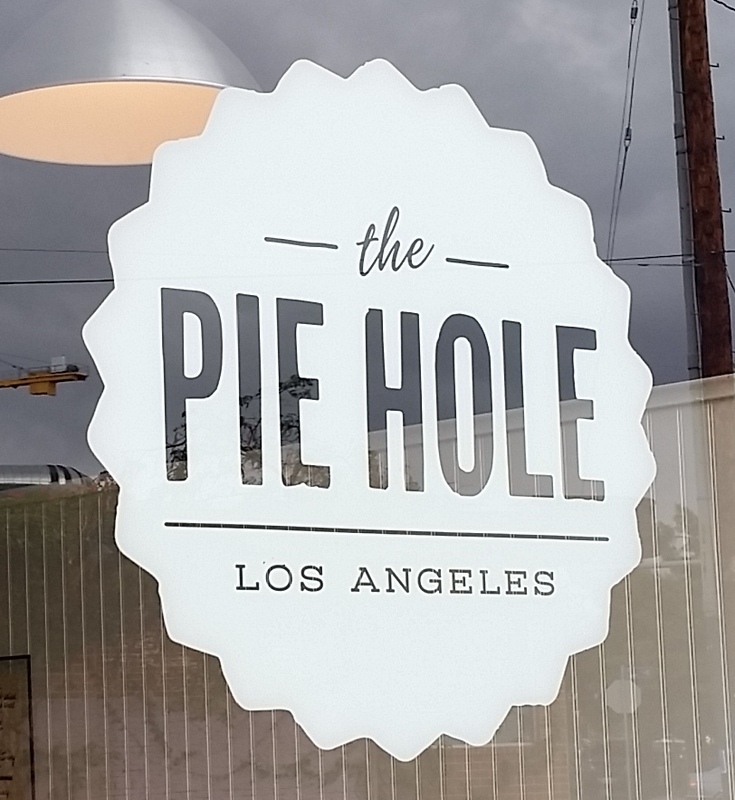 If you love pie, you need to go indulge at The Pie Hole. Slices range from $4.50 to $6.25 each. Bring a friend… that way you and sample two different flavors (and swap if you think they made the better choice). This entry was posted in DTLA Restaurant and tagged Arts District, Dessert, Downtown LA, Downtown LA Restaurant, DTLA, DTLA Arts District, DTLA Restaurant, Pie, Pie Hole, THe Pie Hole. Bookmark the permalink. I can’t wait to visit them on the 30th of this month. You are so funny… I need to try this place!